Churchill is today remembered as a great leader, a war hero, a literary heavyweight and a renowned wit. This incarnation of Churchill is the latest in a long-evolving identity, which at various times has sustained his power, enhanced his popularity and enabled him to personify aspects of British national identity. Indeed Churchill was more aware than most of the performative power of his public life. He lived in an age of the illustrated mass-produced newspaper, with its cartoons and 'Kodak-snappers'. He was well-known for his readiness to appear in uniform for photo opportunities during the Second World War and he not only wrote about the art of political caricature, but collected cartoons of himself, his allies and opponents. 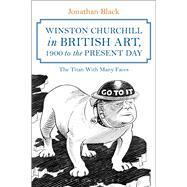 In this heavily-illustrated book, Jonathan Black considers the changing image of Churchill in visual art, from cartoons and paintings to photographs and sculptures. He asks how and why his image developed right up to the present day and examines the extent to which Churchill was complicit in its production. Jonathan Black is a Senior Research Fellow in History of Art at Kingston University, UK. A Fellow of the Royal Society of the Arts, he became interested in the image of Churchill when studying the sculptor Ivor Roberts-Jones, who was responsible for the iconic statue of Churchill in Parliament Square.